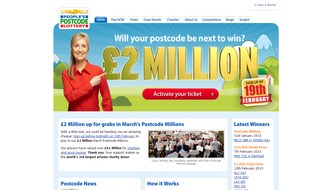 People’s Postcode Lottery Review | Win Up To £2 Million! Postcode Lotteries have been operating around the world since 1989. The People’s Postcode Lottery is a charity lottery has been operating in the UK since 2005. The site is owned and operated by Novamedia. Novamedia also operate 5 other lotteries in other countries and are the world’s 3rd biggest charity donor. This lottery is much different to others as rather than picking numbers the prizes are selected based on your postcode. There are 5 draws every month costing £10 per month. By purchasing the full 5 draws your postcode is in with a chance of winning prizes every day. 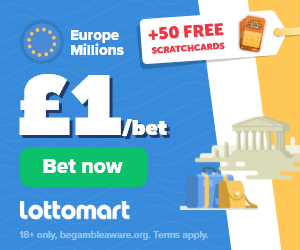 Monday to Friday you could win £1000, Saturday £25,000, Sunday £15,000 and once a month a share in the Postcode Millions draw with a jackpot of £2 Million. One player will also be selected once a month to win a brand new BMW 1 Series and another to win a £5000 dream holiday. By registering with them and then checking out their Facebook or Twitter feeds you can also win additional prizes throughout the month. Some of the prizes that they have given away in the past include up to £250 in shopping vouchers, event tickets and electronic devices such as iPads. 50p from every £2 ticket goes to help good causes in the UK and abroad. Since launching the People’s Postcode Lottery Trust have supported over 1400 Charitable projects. Some of the projects that they support include local communities, young people, the lives of people in Africa, Animal welfare, natural heritage, culture, projects across Britain, human rights, poverty, environmental protection, wildlife, public participation in sport and missing people. To date they have donated over £61 million in funding to these projects and trusts. They also donate money to some well-known charities including the Dog’s Trust, Battersea Dogs and Cat’s Home, the Marine Conservation Society, PDSA, War Child, National Trust, British Red Cross, Friends of the Earth, Water Aid, WWF and lots more. The tickets cost £2 each but to sign up you must pay in advance £10 which covers you for 5 draws. You can choose to pay via Paypal, Credit / Debit card or via Direct Debit. There are no fees for setting up a direct debit but if you choose Paypal or Credit / Debit card there is a 35p fee per month. After you have made your payment you will be entered into the next month’s draws. You have the option of purchasing one, two or three tickets. 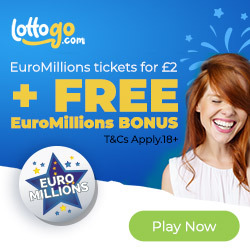 If you purchase two or three tickets and your postcode is drawn then your prize will be doubled or tripled depending on how many tickets you have. This applies to the daily draws and the weekend street draws. If you win the £2 million on the Postcode Millions draw then the amount of tickets you have the more shares in the prize money you will receive. If you win a prize then you will be contacted to be sent your money.